We don’t have to be perfect today. We don’t have to be better than someone else. All we have to do is to be the very best we can. My beloved brethren and sisters, it is a great privilege for me to stand here today and bear my testimony as to the truth of the gospel that has been restored. 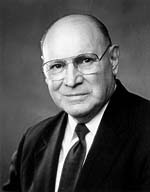 We have just listened to Elder David B. Haight﻿—95 years of age. I just hope my memory is half as good as his at that age﻿—if I live that long. I rejoice when the Saints assemble. Whether as families in humble homes or by the thousands in huge halls, the heavens rejoice when those who love and honor the name of Jesus Christ gather together to worship in His name. We all are going through different life experiences. While some are filled with joy today, others feel as though their hearts could burst with sorrow. Some feel as though the world is their oyster; others feel as though they were the oyster itself, plucked from the ocean, cracked open, and robbed of all that is precious to them. No matter your station, no matter your emotional or spiritual state of mind, I would like to offer counsel to you that may be of use, regardless of where you are in your sojourn through this mortal life. Certainly we have much to be grateful for. And I think if we will consider the blessings we have, we will forget some of our worries. Certainly serenity and joy will come to you if you realize the blessings we have as a Church under the leadership of our wonderful President, President Gordon B. Hinckley. It will help us a great deal. Recently, I read about Erik Weihenmayer, a 33-year-old man who dreamed of climbing Mount Everest, a feat that defies many of the world’s most expert climbers. In fact, nearly 90 percent of those who attempt the climb never reach the summit. Temperatures sink lower than 30 degrees below zero. Besides extreme cold, 100-mile-per-hour winds, deadly crevasses, and avalanches, the climber must overcome the challenges of high altitude, lack of oxygen, and perhaps unsanitary food and water. Since 1953, at least 165 climbers have died in the attempt to scale the 29,000-foot-high summit. In spite of the risks, hundreds line up each year to make the ascent, Erik among them. But there is an important difference between Erik and every other climber who had attempted to ascend before: Erik is totally blind. When Erik was 13 years of age, he lost his sight as a result of a hereditary disease of the retina. Although he could no longer do many of the things he wanted to, he was determined not to waste his life feeling depressed and useless. He then began to stretch his limits. At age 16 he discovered rock climbing. By feeling the face of the rock, he found handholds and footholds that allowed him to climb. Sixteen years later, he began his ascent up Mount Everest. The story of his climb, as you might imagine, was filled with many harrowing and life-threatening challenges. But Erik eventually scaled the south summit and took his place with those who had gone before him, one of the few to stand on top of the highest mountain on the face of the earth. Yes, Erik conquered Everest by simply putting one foot in front of the other. And he continued to do this until he reached the top. Like Erik, we may have obstacles that would hold us back. We may even make excuses why we can’t do what we want to do. Perhaps when we are tempted to justify our own lack of achievement, we can remember Erik, who, in spite of having lost his sight, accomplished what many thought was impossible simply by continuing to put one foot in front of the other. An old proverb states that a journey of a thousand miles begins with a single step. The same principle applies to how you and I can climb to higher spirituality. Our Heavenly Father loves each one of us and understands that this process of climbing higher takes preparation, time, and commitment. He understands that we will make mistakes at times, that we will stumble, that we will become discouraged and perhaps even wish to give up and say to ourselves it is not worth the struggle. We know it is worth the effort, for the prize, which is eternal life, is “the greatest of all the gifts of God.”3 And to qualify, we must take one step after another and keep going to gain the spiritual heights we aspire to reach. We don’t have to be fast; we simply have to be steady and move in the right direction. We have to do the best we can, one step after another. In my younger days, I loved to run. Although it may be hard for you to believe it, I did. And I did win a few races. I’m not so fast anymore. In fact, I’m not sure how well I would do in a race if the only contestants were the members of the Quorum of the Twelve. My ability to run is not so swift now. While I am looking forward to that future time when, with a resurrected body, I can once again sprint over a field and feel the wind blowing through my hair, I do not dwell on the fact that I cannot do it now. That would be unwise. Instead, I take the steps that I can take. Even with the limitations of age, I can still take one step at a time. To do what I can is all my Heavenly Father now requires of me. And it is all He requires of you, regardless of your disabilities, limitations, or insecurities. Let me cite a hypothetical example of a dear sister in any ward, the one who has perfect children who never cause a disturbance in church. She is the one working on her 20th generation in her family history, keeps an immaculate home, has memorized the book of Mark, and makes wool sweaters for the orphaned children in Romania. No disrespect, of course, intended for any of these worthy goals. Now, when you get tempted to throw your hands in the air and give up because of this dear sister, please remember you’re not competing with her any more than I’m competing with the members of the Quorum of the Twelve in winning a 50-yard dash. The only thing you need to worry about is striving to be the best you can be. And how do you do that? You keep your eye on the goals that matter most in life, and you move towards them step by step. I know many feel that the path is hard and the way is dark. But like Erik, the courageous mountain climber, we are not left without a guide. We also have a living prophet, President Gordon B. Hinckley. He provides counsel and prophetic direction for us in our day. Through his counsel and our prayers, we can reach into the heavens and personally commune with the Infinite. Through faith, heaven itself can be moved in our behalf. Doors will be opened and answers received. Think of Joseph Smith, who, as a young boy surrounded by confusing and contradictory voices, yearned to know which of all the churches were right and true. He too felt blind﻿—surrounded by the darkness of his day. After reading the book of James in the New Testament, he believed the words of the ancient Apostle who said, “If any of you lack wisdom, let him ask of God, that giveth to all men liberally, and upbraideth not; and it shall be given him.”9 Joseph believed these words, and on a spring morning in 1820 he retired to a grove of trees to lift up his soul in prayer and ask his Heavenly Father for wisdom. The answer to his prayer filled him with light and direction. Our Heavenly Father and His Beloved Son appeared to him. Their direction swept away the thick darkness that had seized him and threatened to destroy him. It forever swept away his confusion. From that moment until his martyrdom nearly a quarter of a century later, Joseph Smith committed himself to the path shown him by the Father and the Son. Consider how painful his days were. Consider the suffering and the persecution he had to endure. Yet he continued, step by step, never giving up, never doubting that if he only did what he could, his Heavenly Father would make up the rest. All too soon, our time is finished. While we can﻿—while we have the time to complete our work﻿—let us walk in the right direction, taking one step after another. That is easy enough. We don’t have to be perfect today. We don’t have to be better than someone else. All we have to do is to be the very best we can. Though you may feel weary, though you sometimes may not be able to see the way, know that your Father in Heaven will never forsake His righteous followers. He will not leave you comfortless. He will be at your side, yes, guiding you every step of the way. Listen to these beautiful words written by President Joseph Fielding Smith as he describes this life. That we will have the courage to begin climbing our own Mount Everest, that we may progress in life’s journey step by step until we reach the best that is within us. Our Heavenly Father lives and knows and loves each one of us. Jesus is the Christ, the Son of God, the Savior and Redeemer of all, and yes, the Prince of Peace. Joseph Smith is the prophet of the Restoration, and President Gordon B. Hinckley is our prophet, seer, and revelator on the earth today. I bear this testimony, and it is my testimony to you that you will be happy and content if you only do your best. This is my prayer in the name of Jesus Christ, amen. “Everest Grueling for Blind Man,” Deseret News, 5 June 2001, A12; see also Karl Taro Greenfeld, “Blind to Failure,” Time, 18 June 2001. The Teachings of Joseph Smith, ed. Larry E. Dahl and Donald Q. Cannon (1997), 519.